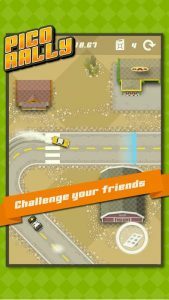 Race your through the continents in this fast and furious game! Rally racing has never been this fun and easy. Control your speed in the curves and try to stay on the road. If there’s another car between you and the winner’s circle – knock it off the track! Win races to unlock new tracks, master them all and explore new parts of the world. Be prepared for asphalt and dirt – a Pico Rally champion must master every road! Don’t forget to challenge your Game Center friends! They will see your personal best as a blue line zooming away ahead. If they beat you, you’ll also get to chase the blue line. Please note that although Pico Rally is completely free, there are items available in the game that cost real money. To disable in-app purchases, do this in your device’s settings. Play two players on the same device. Hours of challenging high speed fun! Loving this game. It reminds me of some of the racing games I used to play on the Commodore 64 back in the day. Really easy to learn and loads of tracks to get through. Gets more difficult slowly which is nice so I’ve stuck at it and am determined to finish it!